Bridget Hutter has a Chair in Risk Regulation at the London School of Economics. She studied sociology at the Universities of London and Oxford and has previously worked at the Centre for Socio-Legal Studies, Oxford and Jesus College, Oxford. She was Director of the ESRC Centre for Analysis of Risk and Regulation (CARR) 2000-2010 where she is now a Senior Research Associate. Bridget Hutter is a Fellow of the Academy of Social Sciences, Fellow of the Royal Society of Arts, a FSANZ Fellow, alumnus of the World Economic Forum Network of Global Agenda Councils and Member of the Regulation & Governance Editorial Board. 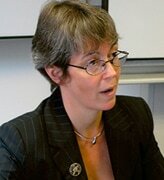 In 2010 she was appointed Trustee and Board Member of the policy research centre The Strategic Society Centre. She is regularly involved in policy-making discussions, with international bodies, business organizations, regulatory agencies and consumer groups. She has given advice to BALPA and the Civil Aviation Authority on the reporting culture amongst pilots; the Environment Agency on compliance and small businesses; HSE on compliance research and regulatory impact; the Pennington Inquiry into the 2005 South Wales E.coli outbreak on food regulation; the Pitt Review Team on regulation and natural disasters; and various regulators on risk-based regulation. She also speaks at conferences, meetings and to international groups on risk regulation issues.